An indispensible resource for all who desire to deepen their knowledge, understanding, and application of the truth of God’s Word -- particularly those who serve as teachers and leaders in the church! 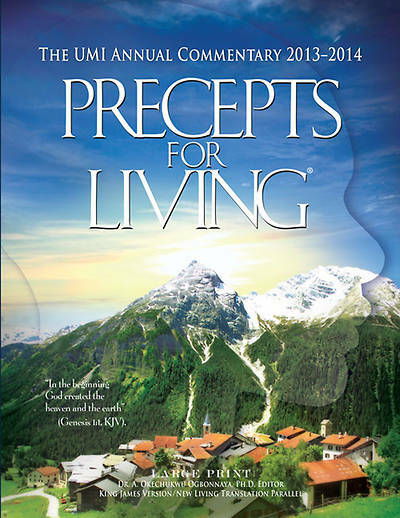 Based on the texts outlined in the International Uniform Bible Lessons series, Precepts for Living® provides a full year of in-depth Bible studies for personal or classroom use. Each week you will encounter the life-changing power of God’s Word, along with the background information and applications you need to make Bible truth clear and lead you, and those you teach, to a faithful life of discipleship. Quarterly essays – Engaging the Theme, Christian Education in Action, Perspective providing a critical look at issues facing black churches, and Heritage Profile of an influential African American.